Saturday July 3 1897 We got an early start up town to take the butter. I did some trading and then we went over home. The Bremmer family and a few others were there. The day was intensely hot. We came home about five oclock to do the evening work. Went over to the [next?] house in the evening to see some fire works the boys had. Sunday July 4th 1897 The boys were not here today and Will and I did not go away from the place. I wrote a couple of letters and read some. Will slept most of the day. Monday July 5th 1897 I did up the evening work and went down to bud the Aunties good bye and was over to Callie's for some currants to make jelly. Will went up town for things we needed. I put in the afternoon sewing. The boys are plowing corn. Tuesday July 6th 1897 I took an early start to go to town./ I was to see Mollie Robinson. She is very sick. After dinner Mother and I was over to Mary Woolfs awhile. I had a hot trip home. did the evening work. The boys began to put in hay. 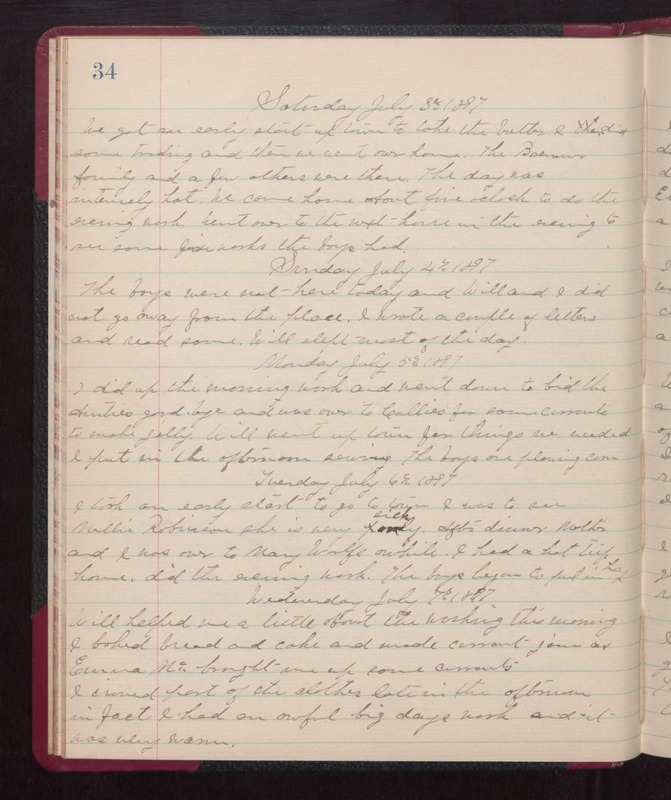 Wednesday July 7th 1897 Will helped me a little about the washing this morning. I baked bread and cake and made currant jams as Emma Mc-- brought me up some currants. I ironed part of the clothes. Late in the afternoon in fact I had an awful big days work and it was very warm.